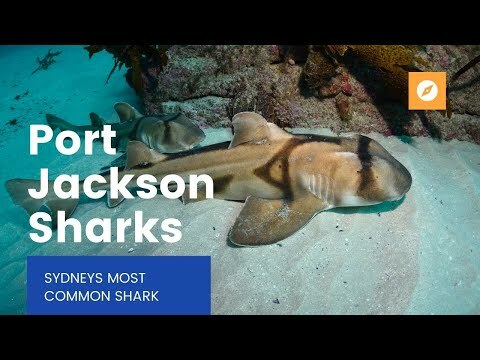 The Port Jackson shark's name, "Heterodontus portusjacksoni", means "different teeth" and this is exactly what the PJ has, The PJ's front teeth are small and pointed, while the back teeth are broad and flat. Their teeth are perfectly adapted to their diet. PJs are not dangerous but like all marine life, they are wild animals and should be treated with respect. PJs have a barb in front of each dorsal fin. This barb is very sharp in young PJs but it grows blunt as the shark matures. 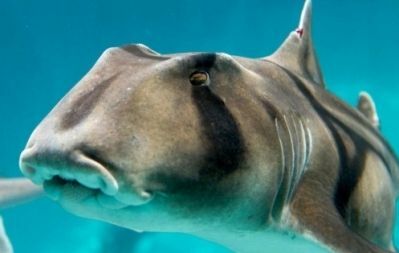 The PJ also has powerful jaws like most sharks, but their mouth is usually too small to be able to do any damage to a human. Common problems to watch out for when diving with PJs is to make sure a startled PJ doesn't run into you! I once had a fleeing PJ swim into my head; let me tell you, they have hard heads. Remember that the PJs are probably scared of divers so try not to harass them too much on your next dive. PJs can grow to 1.65m. But more commonly the males are about 75cm and the females are usually 80-95cm. The PJ has a blunt snout and is usually a browny colour with a black triangular harness-like set of bars converging on the sides and back from the start of the first dorsal fin and bases of the pectoral and pelvic fins. They also have a black strip which runs through to the eyes. It makes it look like the PJ is wearing a superhero mask. The PJ has five gill slits and it is able to do a pretty nifty thing with its gills: it can pump water into its first enlarged gill slit and out through the other four. This enables it to lie on the bottom for long periods without moving. Many other sharks have to swim with their mouths open to force water over the gills. PJs are distributed from Moreton Bay to Tasmania and around to Houtman Abrolhos in WA. Genetic analysis suggests there are two separate stocks of PJs in Australia, one occurring from Queensland to Tasmania and another genetically different group extending from Victoria to Western Australia. There are also distinct subgroups within these groups; Sydney has its own subgroup of PJs that come back to the same spots every year to mate and lay eggs. PJs feed at night, and if you do a night dive you may see these usually docile sharks become very active. They feed on a wide variety of invertebrates such as sea urchins, marine snails, crabs, molluscs and occasionally small fish. PJs usually breed in late winter to early spring. This is when we see large numbers of PJs lying around the bottom under ledges and in caves. They usually return to the same area every winter to breed. The female lays 10-16 eggs around October. Most people have seen PJ eggs as they often wash up on the beach. They are a tough, dark, spiral eggs 7-8cm wide and about 15cm long. They are usually soft when laid and become harder afterwards; they take 10-12 months to hatch. After hatching, the young PJ is on its own. Males become sexually mature at 8-10 years of age and females at 11-14 years of age.